Welcome to Stoney Hill. You've been dreaming of this day for a very long time and we know how much work goes into planning such an important event. Once you arrive at Stoney Hill, the only job you have is to let us take care of you. You're our guest and it is our honor and privilege to make sure your day is flawless and fondly remembered by all. Sit back, have fun and truly experience the beginning of your happily every after. We want you and your guests to feel at home while you are here at Stoney Hill. Relax, have fun and leave the fussing to us. We just ask that you please take a few moments to read over the following information to ensure everything runs smoothly on your special day. You will have use of the barn and surrounding grounds. The bridal party is welcome to use our private home to get ready. Tables, chairs and ivory linens are included. Our facility is handicap accessible. We will assist in the set-up and do the entire cleanup after the event. You will only be responsible for picking up your personal items and decorations that you wish to keep. These items will need to be removed by the end of your reserved day. There are 2 restrooms in the barn. We will have additional portable toilets outside. With a large gravel parking lot, self-sufficient campers/motorhomes are welcome to park here. No hookups are available. Tents also welcome. Cars may be left to pick up the next day. As a private venue, The Barn on Stoney Hill, is not licensed to sell alcoholic beverages. You are permitted to serve, but not sell, alcohol on the premises. The Barn on Stoney Hill, its owners and personnel, is exempt of any and all liabilities that may result from the serving of alcoholic beverages. Music and drinking of alcoholic beverages must end at midnight. No smoking is allowed in any of the buildings. We are not responsible for inclement weather, lost or stolen items, or any other circumstances beyond our control. The client is responsible for any and all damage of the barn and property during your event. Children are the responsibility of the guests who brought them. Children must be accompanied by an adult at all times. Security cameras will be in use for the protection of you and your guests. 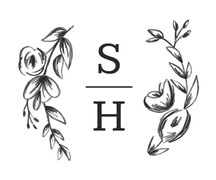 Half of your rental fee will reserve your date(s) and is non-refundable. The other half, plus any other optional services later decided upon, will be due, in full, 2 weeks before the event date. Should your event be canceled for any reason, you are obligated to notify us in writing promptly, so we can attempt to rebook the date. Failure to do so will incur an obligation for the remaining balance due. From the West/St. Paul Minneapolis: Hwy 94 East to Hwy 29 East (towards Green Bay) to Hwy 27 North (Cadott/Cornell) Approximately 9 miles North on Hwy 27 you will come to a sharp S shaped curve. Our road, 170th Avenue (Jensen Road) is in the middle of that curve. Turn right or East. We are 1.5 miles down the road on the left. From the East/Green Bay/Stanley: Hwy 29 West to Hwy 27 North (Cadott/Cornell) Approximately 9 miles North on Hwy 27 you will come to a sharp S shaped curve. Our road, 170th Avenue (Jensen Road) is in the middle of that curve. Turn right or East. We are 1.5 miles down the road on the left. From Gilman Area: Hwy 64 West to Hwy EE. Turn left/South on Hwy EE. 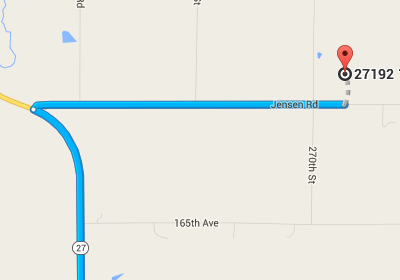 About 5 miles our road, 170th Ave (Jensen Road), will be on the right. Turn right/West. We are ½ mile on the right. From the South/Milwaukee/Madison: Hwy 94 west, exit at Hwy 10 (Osseo). Turn right. Turn left on County Road R.Turn right on Hwy 12. Turn left on Hwy 27 North. From the 4 way stop in Cadott (stay on Hwy 27 North) in approximately 9 miles you will come to a sharp S shaped curve. Our road, 170th Avenue (Jensen Road) is in the middle of that curve. Turn right or East. We are 1.5 miles down the road on the left. From the North/Hayward/Ladysmith: Hwy 27 South. Turn left/East on Hwy 64. Turn right/South on Hwy EE. About 5 miles our road, 170th Ave (Jensen Road), will be on the right. Turn right/West. We are ½ mile on the right. From Duluth/Superior/Bloomer Area: Hwy 53 South. Exit at Hwy 64 (Cornell). Turn left/East on Hwy 64. Turn right on Hwy R. Turn left on Hwy 178. Turn right on Hwy 27 South. Our road is approximately 6 ½ miles down Hwy 27. You will come to a sharp S shaped curve. Our road, 170th Avenue (Jensen Road), is to the left/East in the middle of that curve. We are 1 ½ miles down the road on the left.